Only steps away from the chairlifts. Perfect location for any ski adventure. At last. You’ve arrived. 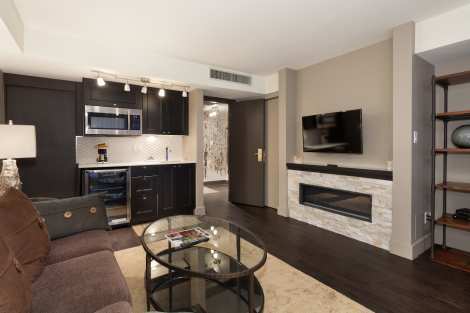 Not only have you chosen to book your Whistler vacation at a luxe vacation destination featuring loads of world class amenities, you’ve arrived at one of the most premier locations in Whistler. The stately appearance of Le Chamois in Whistler on the outside is only rivaled by the warm and welcoming ambiance found on the inside. Located at the base of Blackcomb Mountain, and only steps away from the chairlifts, you will enjoy the ease of access to all of Whistler Blackcomb when you stay at this ultimate ski-in ski-out location. Rejuvenate in the sparkling heated pool and hot tub after a day of adventure or enjoy the fitness centre on-site. Relish the spectacular mountain vistas framed by large windows in each room or take a stroll in the Upper Village and enjoy browsing through numerous shops and restaurants - all just outside your door. Slope side sophistication at its finest with an unparalleled location awaits you at Le Chamois. Walk to resort village 5-10 mins. A little on the small size, and bed could be improved. But great location and a nice remodel. Front desk was great.